The average cost of memory care in Greene County is $5,242 per month. This is higher than the national median of $4,650. Cheaper nearby regions include Christian County with an average starting cost of $4,311. To help you with your search, browse the 8 reviews below for memory care facilities in Greene County. On average, consumers rate memory care in Greene County 4.8 out of 5 stars. Caring.com has helped thousands of families find high-quality senior care. To speak with one of our Family Advisors about memory care options and costs in Greene County, call (855) 863-8283. Greene County, nestled at the base of the Ozark Mountains in southwest Missouri, is home to 275,175 residents, with 14 percent of those residents being seniors in the 65 and older age group. Some of these seniors may be among the 110,000 Missouri residents who have been diagnosed with Alzheimer’s disease, dementia or other cognitive impairments. By 2025, that number is expected to increase by more than 18 percent. There are five memory care facilities in Greene County to care for this growing number of seniors, all five of which are located in Springfield. All of Missouri, including Greene County, refers to memory care facilities as Assisted Living Facilities and Residential Care Facilities, both of which are licensed by the Missouri Department of Health and Senior Services, Division of Regulation and Licensure, Section for Long-Term Care Regulation. 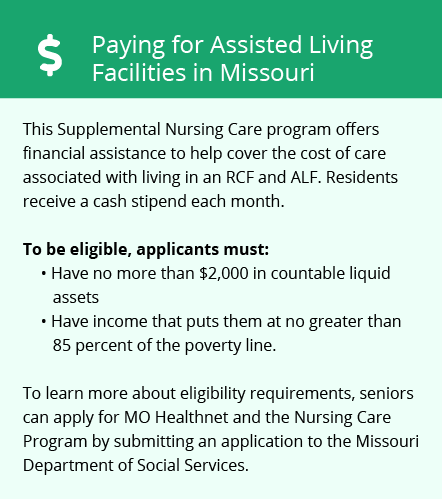 Seniors with tight budgets might find living in Greene County leaves them with less money for their facility expenses. Although Missouri only partially taxes social security income and public pensions, private pensions and retirement savings account withdrawals are fully taxed. The air quality in Greene County ranks 54 on a scale where 100 represents the best air quality, compared to the national average of 58. Seniors with COPD or asthma may have a harder time breathing in the county than in other parts of Missouri. The cost of living in Green County is 89.3, lower than the national average of 100. Groceries and housing also rank higher, while transportation is on par with the national average and healthcare ranks slightly higher at 103. Seniors may find that the lower costs of other expenses help offset the higher healthcare costs. On a 100-point scale where 100 represents the locations with the highest crime rates, Greene County has a violent crime rate of 43.3 and a property crime rate of 47.3 compared to the national averages of 31.1 and 38.1, respectively. Seniors living in a memory care facility are generally protected by the safeguards the facility offers, such as alarms, self-locking doors and security cameras. Memory Care costs in Greene County start around $5,242 per month on average, while the nationwide average cost of memory care is $4,778 per month. It’s important to note that memory care rates in Greene County and the surrounding suburbs can vary widely based on factors such as location, the level of care needed, apartment size and the types of amenities offered at each community. Greene County and the surrounding area are home to numerous government agencies and non-profit organizations offering help for seniors searching for or currently residing in an assisted living community. These organizations can also provide assistance in a number of other eldercare services such as geriatric care management, elder law advice, estate planning, finding home care and health and wellness programs. To see a list of free memory care resources in Greene County, please visit our Assisted Living in Missouri page. 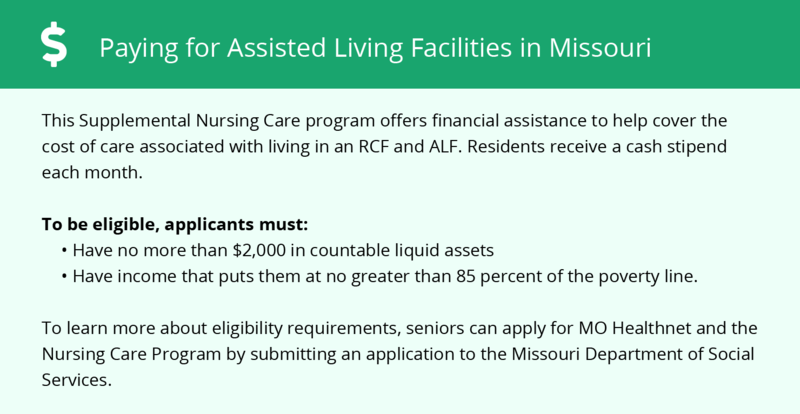 Greene County-area assisted living communities must adhere to the comprehensive set of state laws and regulations that all assisted living communities in Missouri are required to follow. Visit our Memory Care in Missouri page for more information about these laws.